I have been working on more ATCs based on the colours of Australian Gemstones, similar to my one featured way back on Feb 12th which represented Copper. 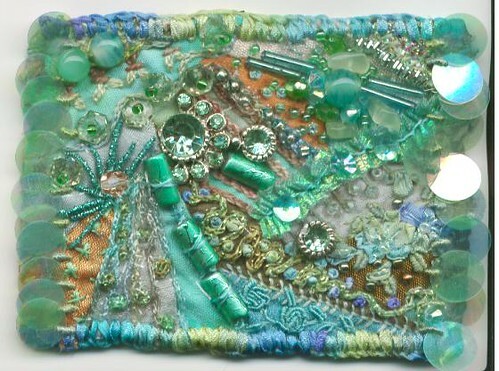 This first one represents the gorgeous soft minty greens of Malachite. I was lucky to find a broken necklace at the local St Vinnie's op shop which was exactly the right colour and that became my starting point. The second ATC is totally glittery gold. 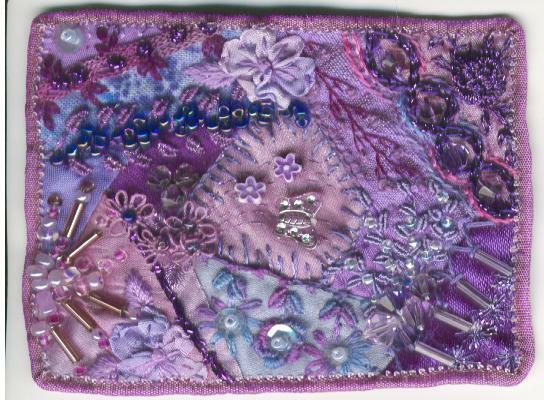 Unfortunately, the scanner "killed" the sparkle but makes it easier to see the stitching and embellishments. 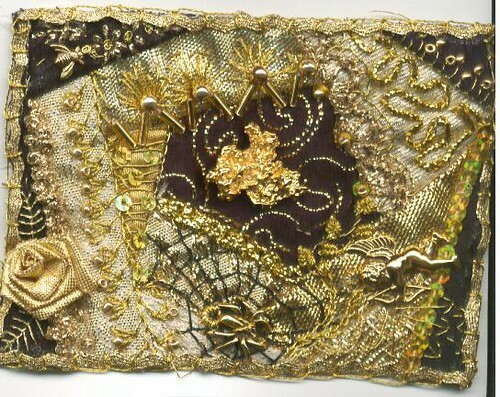 I needed to bring in the black fabric and spider's web to make a contract between all the glitz! This is the third one based on Argyle Diamonds which come in White, Champagne, Cognac and Pink. 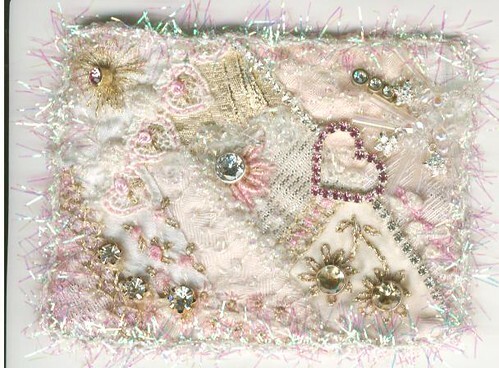 Once again, this ATC is really sparkly and features lots of diamantes and sparkle. The two champagne coloured flower centres and the white circular "diamond" in the centre were earrings, once again from St Vincent de Paul's op shop. I paid $5 a pair for them and when I got home I noticed that they were still on their original cards and had been priced at $47.95 pair.....bonus!! This is a very gentle ATC representing Amethyst. My five year old grand-daughter brought me the plastic butterfly and two little flowers from her own bead box and suggested that I sew them in the very centre......so I did! I loved her input and interest so I might make her a little purse out of the ATC. wow! I love everything you've done. It's really inspired me to have a go at crazy quilting. I liked the idea of making little bags, my friend and I are hopefully going to have a little stall at the next markets and little bags and purses would be perfect to sell there, if i can part with any!